February 28, 2019 | Centro Team | Centro in the News! The startup announced in December that it hopes to bring a total of 325 of its pop-up hotel rooms to the county this year, splitting them between the residential tower attached to the Ballston Quarter development and the “Centro Arlington” project, which is taking the place of the old Food Star grocery store off the Pike. Since then, the company has been working to secure county approvals for its unusual business model. WhyHotel strikes deals with owners of large new residential buildings to rent out blocks of furnished apartments, helping property owners make some extra cash while they work to find more permanent tenants. The firm also brings along a full on-call staff to handle cleaning and other guest needs to each property, providing customers with a bit more than a simple hotel might offer. 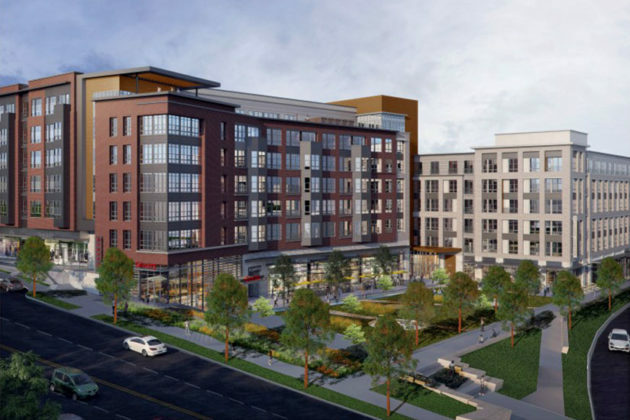 The County Board approved the zoning changes necessary for the company to set up its Ballston Quarter rooms on Jan. 26, and the Planning Commission voted unanimously Wednesday night to recommend that the Board do the same for the Centro Arlington development. WhyHotel expects to have 175 rooms ready in Ballston by April, with the remaining 150 on the Pike available sometime this summer or fall. In both cases, the company will have the county’s permission to offer the temporary rooms for the next two years. But WhyHotel executives expect they’ll need much less than that, given the demand for new apartments in Arlington these days. CEO Jason Fudin told the Planning Commission that the company’s first effort at “The Bartlett” complex in Pentagon City lasted just five months before the building was fully leased out. “We leave pretty quickly when things go well in Arlington,” Fudin said. Planning Commissioner Stephen Hughes says the company’s deference to long-term renters eased his mind in considering WhyHotel’s business model. He pointed out that “long-term leaseholders take precedence” in the company’s arrangements with Arlington property owners, which is why WhyHotel tends not to stick around for too long. “Neighbors, of course, hope to have long-term neighbors,” Hughes said. But that hesitancy doesn’t mean that county officials are opposed to the idea of short-term guests on the Pike. In fact, Hughes hopes WhyHotel’s stay in Centro Arlington spurs more conversations in the business community about the viability of other hotels in the area. “The data will now be there for the bankers and investors to see whether a current, flat service parking lot may be a suitable hotel in the future,” Hughes said.